Jewish Home MK Yogev slams New Right's Naftali Bennett, says he's not fit to be Defense Minister. 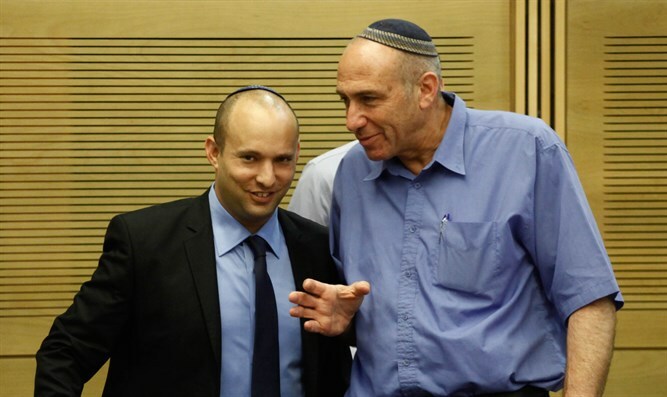 Diplomatic-Security Cabinet member MK Moti Yogev, who places third on the United Right list, on Monday morning told Galei Israel that Education Minister Naftali Bennett (New Right) will not make a good defense minister. "A good defense minister needs first of all to be experienced, with a large amount of knowledge," Yogev said. "He needs to have good judgment and be willing to listen - not be a person who has an abstract idea that calm and denial solve complicated problems in Judea and Samaria or Gaza." Taking apart Bennett's plan of action, Yogev said: "First of all, we're not sending soldiers into Gaza. Any person with military experience knows that in order to win, you need to pay a price. War is not pretty and unfortunately it's not a movie that runs for two hours and ends with walking outside to eat sunflower seeds. Every step like this has a price. We can't beat Hamas without boots on the ground." "During Operation Protective Edge, we bombed tunnels from the air. It didn't destroy them or eliminate the tunnels. Minister Bennett was the one who opposed that. During the Gulf War, the US had difficulty dealing with the rockets fired at Israel without sending foot soldiers in to destroy the Iraqi batteries which were sending the rockets to Israel. We can't beat Hamas properly unless we do it with foot soldiers, not just from the air." Slamming Bennett's idea to temporarily evacuate the Jewish towns on the Gaza-Israel border, Yogev said, "That sends a tough message. It closes the circle, as if it were a disengagement. If I'm not mistaken, Minister Bennett never expressed the clear diplomatic thought that Gaza is part of Israel and if we don't return to settle it, we won't know how to protect ourselves." "Everything else requires a comprehensive plan, including normalizing Gaza and allowing its youth, who suffer 70% unemployment, to leave it. We need to allow them to emigrate from there and even to work in Israel. With the plan to rehabilitate Gaza, we'll bring back our sons. We won't manage to bring our sons back without entering Gaza, without purging it. It's easy to spout plans that buy votes, but creating a safe region from Gaza a lot more complicated.